YouSiP-IoT is a comprehensive platform solution designed for emerging application as IoT based on SMIC 55nm low leakage (LL) and 95nm ultra low power (ULP) process which can provide embedded non-volital flash memory as well. 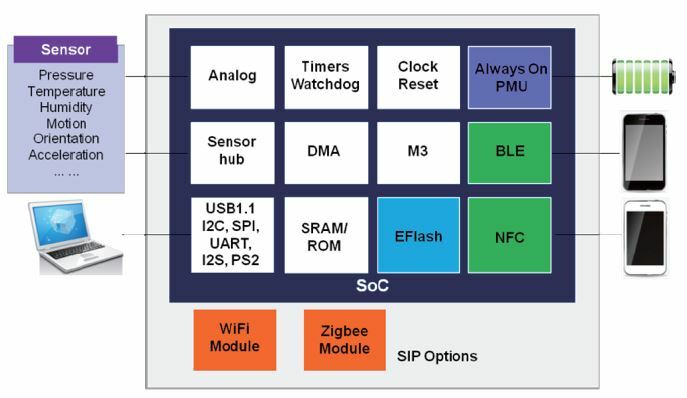 This solution integrates ARM Cortex Mx series MCU or Synopsys ARC EMx serises CPU and CEVA TeakLite or MM series DSP, involves WiFi, Bluetooth/BLE interfaces, which can connect to a series of different sensors. YouSiP-IoT platform can assist customer to reduce the processing delay time, enhance the data security, improve the data rate and reduce power consumption of their SoC design, which is adopted in battary power supply environment as smart home, IoT and wearable devices with excellent low power managment. IoT Companion Chip Solution To differentiate customer s applications by voice recognition, finger print, gesture detection etc.